When I look at a man page in my 'console' (not an xterm) I see some coloration, but I don't get this in my xterm's (e.g. konsole) is there any way I can enable this? hopefully a fairly simple solution? You need to use the termcap(5) feature. The man page on some Unices says this tool is obsolete and to use terminfo, but it's still available on others (and terminfo is more complicated). More importantly, less uses termcap. # Use colors for less, man, etc. NOTE: See Documentation on LESS_TERMCAP_* variables? for how this works. If $MANPAGER or $PAGER is set ($MANPAGER is used in preference), its value is used as the name of the program used to display the manual page. By default, pager -s is used. The value may be a simple command name or a command with arguments, and may use shell quoting (backslashes, single quotes, or double quotes). It may not use pipes to connect multiple commands; if you need that, use a wrapper script, which may take the file to display either as an argument or on standard input. For the win, combine with export MANPAGER='less -s -M +Gg' (source) to display your percentage into the document. If you use Oh My Zsh, you can add colored-man-pages to the plugins array in your .zshrc file. This also works in xterm. And then just define an alias in the *rc file of your favorite shell. $ alias man="TERMINFO=~/.terminfo/ LESS=C TERM=mostlike PAGER=less man"
If you want to modify the terminfo file, use infocmp mostlike to get the content of it later. Not the answer you're looking for? Browse other questions tagged colors less man pager termcap or ask your own question. How to highlight some text on a man page? Less command change color of “~” and “(END)”? How to use terminfo to set colors for man and less? How to get colours on man pages with w3m as a PAGER? Terminal emulator for Debian Xfce that will accept $TERM=linux, just like login console tty uses? 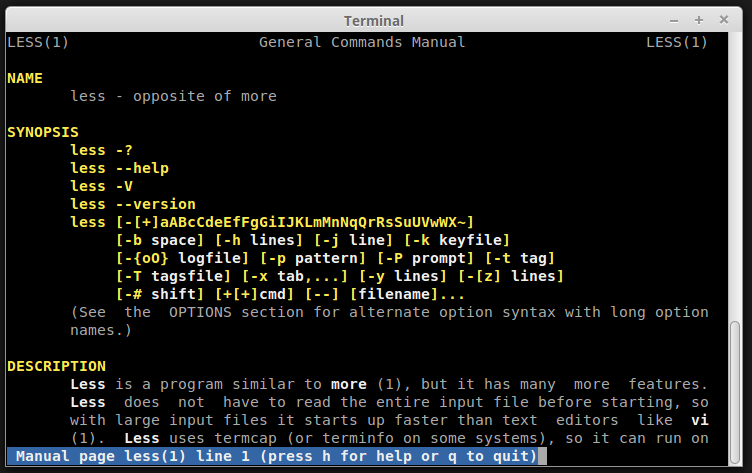 How to substitute one color code for another in terminal? How does Solaris find man pages? When to use man and man -k to check manual pages? man page search - how can I turn off the highlighting after matches found? How to grep man pages for a word?